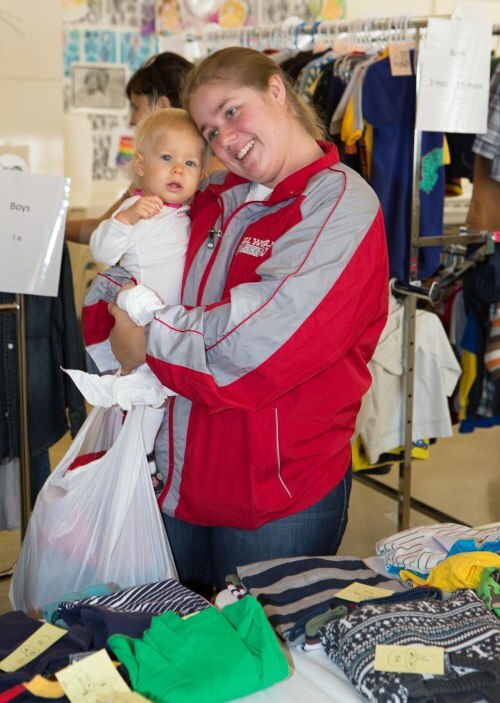 The idea behind the SCA's Toy & Clothing Boutique is deceptively simple: Neighbors and Meher Schools parents donate "gently used" clothing, toys, and books their children have outgrown and take home items others have donated. There is no admission charge, everything is free, and it isn't necessary to donate something to take something. The Boutique is held three times a year The Meher Schools, on Leland Dr. in Lafayette, in space donated by the school and the Searchlight Bookstore, which is housed at the school. Clothing is neatly displayed in a pleasant, boutique-like setting in one of the classrooms. Toys and books are neatly arranged in Searchlight. Refreshments are provided. Flyers announcing the Boutique are hand-delivered by SCA volunteers to some 1,500 homes in the Saranap area in the weeks leading up to each event. SCA volunteers pick up donations from donors' homes, and Meher Schools parents drop them off at the school office. Guests also bring donations on the day of the Boutique. Boutiques are generally held in early fall, around the holidays, and in early spring. Our Holiday Boutique will take place December 22. Want to help? Nearly 100 volunteers spend more than 200 hours preparing for and staging each Boutique. Volunteering is a way to serve your community and meet your neighbors. If you'd like to help with future Boutiques, please fill out the form below. We'll be in touch!